Welcome to The Holocaust Chronicle web site. T his is a not-for-profit project. Index Search: By clicking on the Index link on the navigation bar, you can easily find all instances of any word, name, or location that appear in The Holocaust Chronicle. Keyword Search: The entire Holocaust Chronicle web site may be searched using a simple keyword, such as Munich or Theresienstadt. A new page will appear with search results, short descriptions of the destination pages, and links directly to those pages. 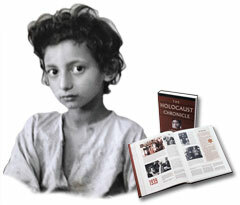 Go Directly to a Chapter: The Holocaust Chronicle is written in a chronological format, and every year from 1933 to 1945 represents a separate chapter of the book. You may use the Chapter pull down menu to go directly to the beginning of each chapter. Page Number: Entering any page number between page 17 and page 698 in the Page Number search box will take you directly to that page. Date Search: Events can be found utilizing the Date Search function. To view events that happened within a span of dates, select the month, date, and year in the From and To set of pull-down menus. To find events that happened on one specific date, only enter information into the From pull-down menus. If you have any questions on the content of The Holocaust Chronicle, or how to best utilize the site, please do not hesitate to contact us. © 2002 Publications International, Ltd.